Am I the only one that thinks these cookies look Christmassy? There's something about the snowy white icing sugar that makes me think of Yuletide. Every November, I tell myself I'm going to be super organised and do the whole homemade, personalised Christmas gift thing and then spend December in a state of relaxation and poise. Instead, I always find myself getting sucked into the shopping spirit and spend December running around malls like a madwoman, snapping up Christmas presents left, right and centre! 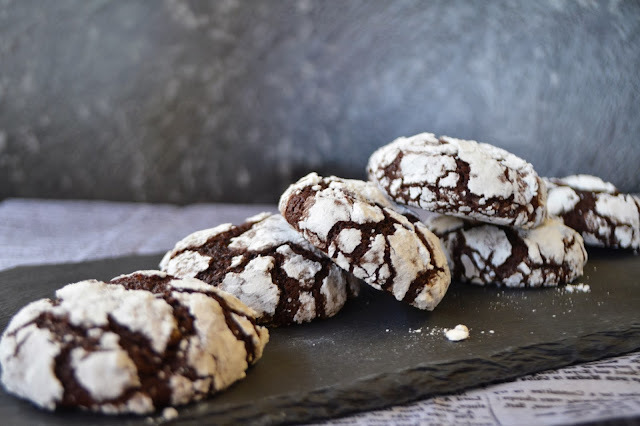 However, these cookies are amazingly easy and so pretty that I may be able to inject a little homemade love into my Christmas gift giving this year. These cookies are known as both Chocolate Crinkles or Chocolate Crackles. 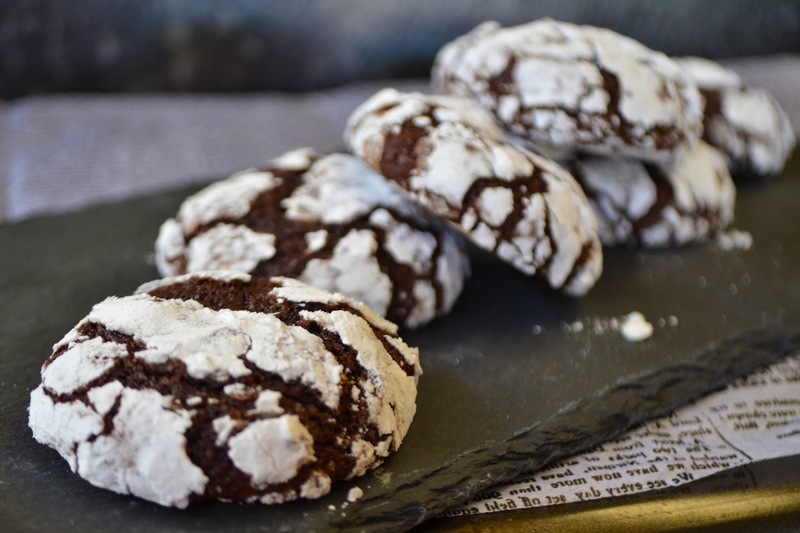 Personally, when I think of Chocolate Crackles, I think of the treats made out of Rice Bubbles, Copha and cocoa so to me, these are Crinkles! Read on for the recipe! I used a recipe from David Herbert's book Best-Ever Baking Recipes, which is an absolute gem of a book. It's gorgeously photographed, the recipes are insanely simple and everything I've made from the book has turned out perfectly. If you're into baking at all, I definitely recommend adding this title to your collection. 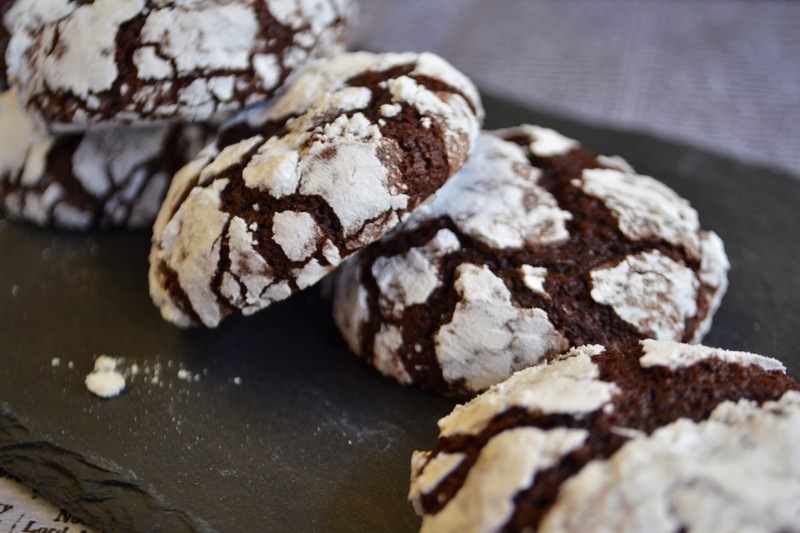 These cookies are soft, fudgy and deeply chocolatey. They're a bit brownie like but with an airier, crispier crust. Yum! Place the flour, cocoa, baking powder, sugar and salt in a bowl and aerate with a whisk, making sure to break up any lumps. Rub the cold butter into the dry mix. David Herbert used diced, cold butter in his recipe but I've found that grating the cold (or even frozen) butter into the dry mixture works just as well and is easier to rub into the flour mix. In a jug, whisk together the eggs and vanilla extract before adding to the flour mixture and mixing with a large metal spoon until combined. Preheat the oven to 200ºC and line 2 baking trays with baking paper. Portion out tablespoonfuls of the dough and roll into balls. I used a small spring loaded ice cream scoop to portion out my dough. Roll the balls in icing sugar, making sure the icing sugar covers them liberally. Place the balls on the lined baking trays about 5 cm apart and bake for 10 minutes or until puffed and crackled. Allow to cool on the trays for at least 5 minutes before transferring to a wire rack to cool thoroughly. Enjoy with a large glass of ice cold milk! Cookies will keep in an airtight container for up to 5 days. Dang. They look good. 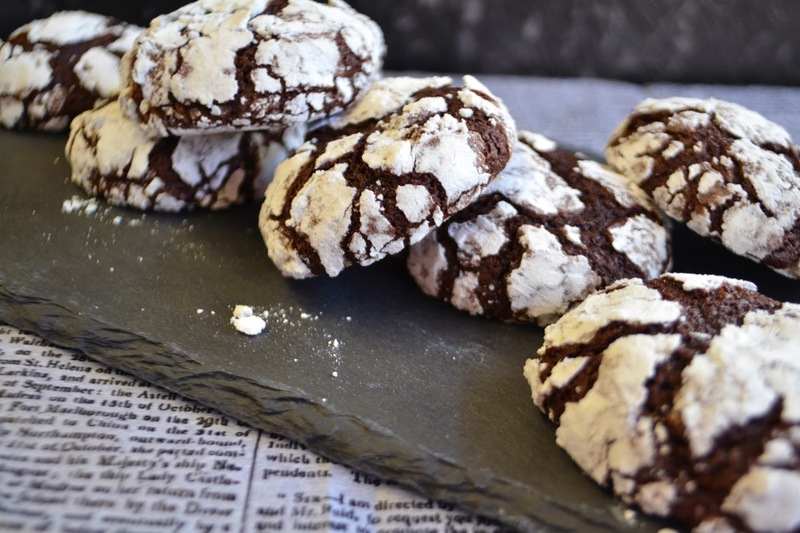 One of my favorite cookies for the holidays. Love the newspaper. I'll have to try that in some photos.